Due to its size and geographic location, Australia is spread over a range of different climactic zones and weather patterns. We’ve put together a state by state summary of the weather you can look forward to in Australia. Learn more about New South Wales. WA takes up a third of the Australian continent, so it’s no surprise that its weather is varied from tropical in the far north to a dry inland and Mediterranean Perth. Learn more about Western Australia. Learn more about South Australia. 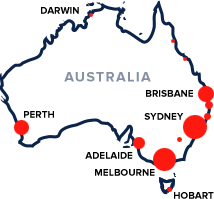 Learn more about the Australian Capital Territory. Learn more about the Northern Territory.